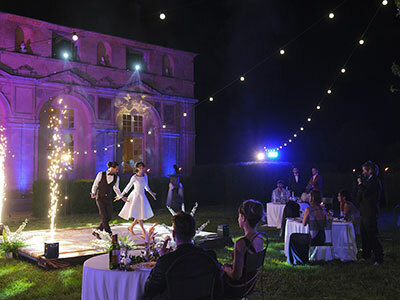 Animations at the chateau for your wedding in France. > Light shows synched to your DJ's music all night long. Sound System NEXO 2 PS 15 + 2 PS 15 Sub + 2 RS 15 subwoofers + 6 PS 8 on backgrounds. Sound control 2 Pioneer CDJ 2000 Nexus2 turntables, Pioneer DJM 900 Nexus2 mix table, 4 Shure SM 58. Lights 8 beam fixtures R1 along the hall (4 each side), 2 led bars inside the 2 alcoves, fog machine, 1 tetra P17 32A, 1mg16XU. Sound System 1 HK audio pack, HK Linéar 5, 2 HK audio elements band packs. Sound control Yamaha MG 10 XU mix table, 1 fixed wall screen (2m x 1,8m video projection), 1 tetra P17 32A at the kitchen park + arbour storage. Sound System 8 DAS Audio Arco 24 TW speakers + 2 DAS Audio Arco 12 subwoofers. Sound control Yamaha MG 10 XU mix table, 1 fixed wall screen (2m x 1,8m) and fixed video projector. 2 Cabasse satellites, 2 KV2 Audio subwoofers. Bluetooth via Pc connection, smartphone. The first time that Chloé sang at the chateau was for... her own wedding! Since then, she has also filled the church, the rose garden and the Grande Galerie with pure emotion. OK Fred plays a varied, refined and constantly updated repertoire of Pop & Jazz music, as well as all of your Motown and Rock classics. 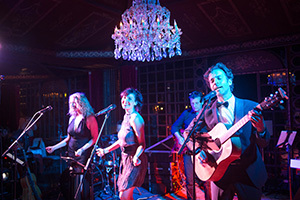 Or for something different, a classy band with dancers; OK Fred works with a selection of visual performers from the great Parisian cabarets: variety shows, dancers, illusionists, table magicians, one-man shows and comedy magicians! «Out of the Blue» are the two best friends you ever wished for! 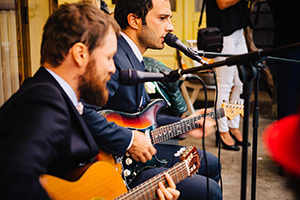 During your wedding, Nicolas (guitar, lead singer), and Benjamin (guitar, vocals, harmonica) will get your groove on. They will guess your favorite playlist, whisper the words to your ears and will share with you a rare moment. From €500 vat incl. Aquarela offers to color your wedding music through a sweet, warm and rhythmic playlist, ideal for a cozy and lounge atmosphere. His repertoire is built around the best of Brazil. Treat yourself to a bit of sun thanks to Bossa Nova. 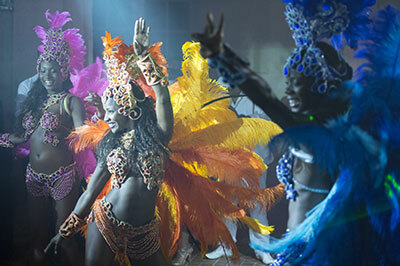 A musical and original set that takes you for a ride in the most exotic places of the Caribbean islands to the sound of traditional drums and djembes. 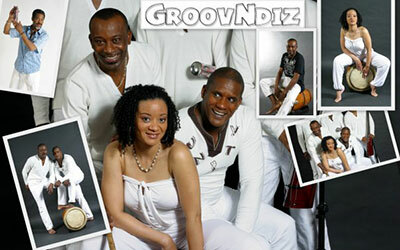 A mesmerizing and rhythmic music, that will drive everyone to the dance floor, for sure. 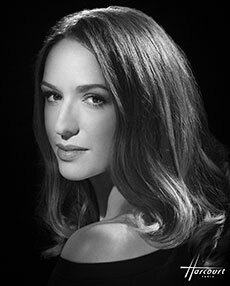 Be seduced by Neila. She will take you to the land of the Arabian Nights; glittering costumes, veils and spellbinding rhythms for your Henna or wedding eve at the Oriental Pavilion. Bride appearance: an original and surprising way to introduce the wedding couple. The bride appear inside a giant book! The perfect choice to start the evening in a magical way! Levitation: a child from the audience floats into the air under Arno’s magical power. An unforgettable moment for the child and the guests! Close-up magic: during your cocktail, Arno shares his magic to your guests. They witness the illusions up close and take part of the magic. Friendly, amazing and inescapable: Figaro, a regular at the castle will amaze the guests; from children honor to deans, from cocktail to wedding dinner. 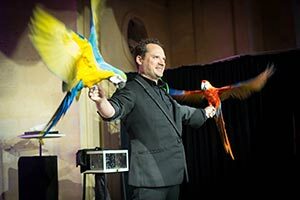 Professional artists for over 16 years, Aurore and Sébastien tame close-up entertainments, magic shows on stage, illusions and more intimist services. 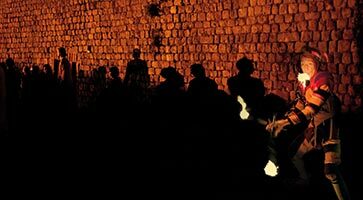 "Beyond the high trails night owls, we joined and made a heavenly round..."
Les Voyageurs du Bord des Mondes offer street theater performances, storytelling shows, custom creations, etc.